​What do you see? An unknown girl is painted against a black background. The girl is shown from the side but turns her brightly lit face towards the viewer. She is wearing a large, pear-shaped, shining pearl earring. On the top left of the pearl, the light is reflected, while at the bottom there is a less visible reflection of her white collar. The size of the pearl is similar to the size of her eye, which means that it is a very large pearl compared to the pearls we commonly see in contemporary pearls used for jewelry. Vermeer painted similar earrings in Girl with a Flute and Girl with a Red Hat, which are both displayed in the National Gallery of Art in Washington, DC. The girl in this painting is wearing exotic clothes. She wears a brown-yellow jacket with a white collar and a blue turban around her head with a yellow cloth that hangs down. Her mouth is slightly open, and her red lips contrast nicely with the color of her face. She is looking mysteriously at us. People do not agree on what emotions she expresses. For example, is she happy or is she sad? Notice also the technique of Vermeer in this painting. You can see his brush strokes in her clothing, but her face consists only of invisible brush strokes which adds to the tranquility of this painting. Vermeer included the famous reflection of light in the pearl earring, but when you look carefully, the light also reflects in her eyes and her lower lip. Backstory: After the death of Vermeer in 1675, the painting was probably owned by Pieter van Ruijven, the patron of Vermeer. After that the ownership of the painting is unclear. However, in 1881, this painting reappeared and was sold at an auction in The Hague for two Dutch guilders and thirty cents to the art collector Arnoldus Andries des Tombe. This amount is equivalent to a bit more than $1 at that time, and this amount would be worth about $28 nowadays. The painting was in a bad state at that moment, and the painter of it was unknown. While restoring the picture, it was discovered to carry the signature of Vermeer. In 1902, Des Tombe died, and his collection of paintings was donated to the Mauritshuis. It stayed there until 2014, but when the Mauritshuis was remodeled, the painting went on a world tour. After it came back, the Mauritshuis swore that the painting would never leave the museum again, just as, for example, The Birth of Venus by Sandro Botticelli in the Uffizi Museum. Nowadays, the painting is also known as the Mona Lisa of the North because of the curious expression of the girl. What is a tronie? This painting is a so-called tronie. A tronie is a study of a face that stands out, a particular expression of the face, or the expression of a particular character. To create a tronie, an anonymous model was used. In the case of this painting, it is indeed unknown who the model was. The word tronie comes from the Dutch language and means ‘face’. Tronies were particularly popular in the 17th century in The Netherlands and were popularized by Rembrandt. Another example of a tronie is Gypsy Girl by Frans Hals, which is in the Louvre in Paris. Girl with a Pearl Earring in popular culture? In 1999, the author Tracy Chevalier wrote a fictional book entitled Girl with a Pearl Earring (Amazon link). This book has been inspired by Vermeer’s painting and has been sold over three million times. In 2003 the book was made into a similarly-entitled movie (Amazon link) with Scarlett Johansson and Colin Firth. Who is Vermeer? Johannes Vermeer (1632-1675) was born in Delft in The Netherlands. He lived there his whole life. He married in 1653 with Catharina Bolenes and they got 15 children together. Vermeer took a lot of time to complete a painting, on average about four months. While he was perceived as a good painter by his contemporaries in Delft, he was largely unknown outside his hometown. Vermeer was familiar with the works of some other Dutch painters, but his work has almost not at all been influenced by foreign artists. Other well-known works of Vermeer include The Milkmaid in the Rijksmuseum in Amsterdam and View of Delft, which is also in the Mauritshuis. Fun fact: Pearls can be found inside the shell of a mollusk. Most pearls come from oysters, but they can also come from snails. The biggest pearl in the world is about 34 kilos (75lbs). So, even though large pearls do exist, it is very likely that the girl in this painting is not wearing a pearl earring, but an earring made of some metal. The reason is the reflection of the light in the earring which would only be possible if it is made of a metal object such as tin or a mix of tin and silver. The painting was initially known under several names, such as Girl with a Turban, but none of these names included the word pearl. However, in 1995, the Mauritshuis changed the name of the painting to the Girl with a Pearl Earring, and despite the doubt about whether it is really a pearl the Mauritshuis decided not to change its name again. What do you see? King Saul is depicted on the left. He has a curtain in his left hand and a spear in his right hand. Saul suffered from melancholic moods. The young David is shown on the right. He is sitting a bit lower than Saul and plays the harp to calm down Saul when he experiences one of his depressive moods. David is absorbed in playing the harp and does not seem to notice Saul. However, Saul cannot contain his tears and is drying the tears in his left eye with the curtain. With his right eye, however, he is looking intensely at David, thinking about ways to kill him. Rembrandt offers us a view into the future of this story as not much later Saul will indeed throw his spear at David. Backstory: David has just beaten Goliath and the Philistines and is back in the palace of King Saul, who is afraid that David will take his position as king due to his enormous popularity. The story in the painting is based on 1 Samuel 18:10: “The next day an evil spirit from God suddenly took control of Saul, and he raved in his house like a madman. David was playing the harp, as he did every day, and Saul was holding a spear.” Saul was considering to kill David, but he also knew that if he did that the people would turn against him. Saul threw the spear twice at David, but David could dodge it both times. His next move was to send David to war in the hope that he would be killed there, but David was very successful in the war as God protected him. Symbolism: The painting reflects how Rembrandt imagined the scene in which David was playing the harp for the depressive King Saul. Most elements in the painting come directly from the 17th-century translation of the Bible, but most notably Rembrandt added the curtain. It allowed him to express two different emotions of Saul at once. The tears in his left eye because of the beautiful music and the anger and jealousy of David’s growing popularity in his other eye. More generally, Rembrandt expresses in this painting how music can help to diminish depressive moods. Rembrandt painted an earlier version on this same topic in which he did not express these emotions that clearly. Why David and Saul? David has been a popular topic in art. One reason for his popularity is that his life and his experiences are described in great detail in the Bible, providing plenty of inspiration for artists. Another reason for his popularity in art is the range of emotions and roles that he fulfilled. He started as a young boy who was chosen by God to be the future King of Israel. Next, he became a hero by killing Goliath. Right after that, he was described as the great harp player who could calm down King Saul. Later he becomes king and even gets involved in an adulterous affair. Who is Rembrandt? Rembrandt Harmenszoon van Rijn (1606-1669) is one of the great painters of this world. He was born in Leiden, The Netherlands, but spend most of his adult life in Amsterdam. Rembrandt was a master of using the contrast between light and dark in his work. He was a very productive artist, and much of his work involves religious scenes, self-portraits, and portraits of others. He has created almost 100 self-portraits in his life. Together with Caravaggio, Rembrandt is by many considered to be the greatest painter of the Baroque period. Some of his famous works include The Night Watch in the Rijksmuseum in Amsterdam and The Anatomy Lesson of Dr. Nicolaes Tulp which is also in the Mauritshuis. A real Rembrandt? For a long time, this painting was considered a real Rembrandt painting. However, in 1969, doubt was cast on whether Rembrandt had painted this work. Art historian Horst Gerson published a book about all the paintings of Rembrandt and did not believe that Saul and David was painted by Rembrandt, but rather by one of his pupils. The interest in this painting suffered a lot because of this doubt. Proving that this was a real Rembrandt or not turned out to be a rather difficult task. Only in 2007, the Mauritshuis started an 8-year long investigation, which eventually proved that the painting was, in fact, a real Rembrandt. The proof was difficult because the painting has been created in two different phases. In the first phase, a very precise painting technique was used (for example, look at David and the harp). In the second phase, the brushstrokes were less precise (for example, look at the cloak that Saul is wearing). Fun fact: This painting has been a mess over time. It has been cut into pieces and other people have painted on top of the original painting. If you look at the painting, you can see that it consist of three different pieces (this is much clearer in this picture of the painting before the restoration started). 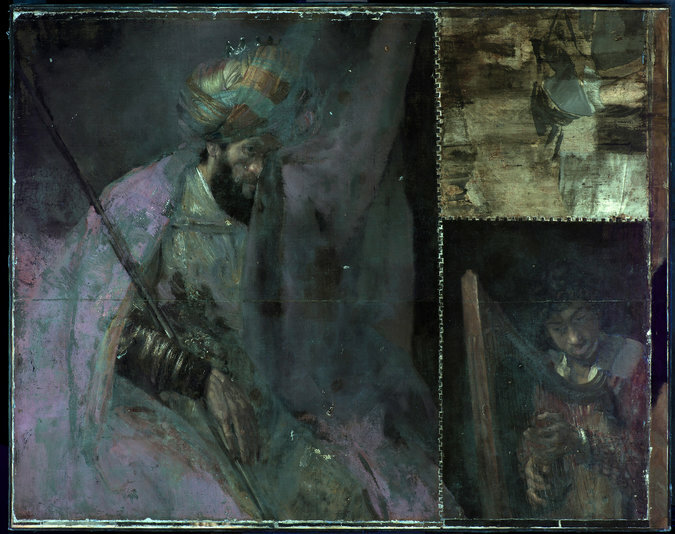 A big piece with Saul on the left, a smaller piece depicting David on the bottom right, and another smaller piece in the right top corner with just a dark background. The most probable reason for why this painting has been cut into different pieces is that the top right of the painting got damaged and that the owner has decided to create two rectangular painting out of it (one piece with Saul and another piece with David). However, this remains speculation. What do you see? Dr. Nicolaes Tulp, the central figure with the hat, is giving an anatomy lesson to the guild of surgeons. The body that he analyzes is from the criminal Aris Kindt. His body is partly shaded to indicate that he is dead (see also the black lips), which is a technique called umbra mortis (which means shadow of death). Dr. Tulp (which means “tulip” in Dutch), has an instrument (a forceps) in his right hand and shows how the muscles in the arm are attached. With his left hand, he illustrates to the audience the movement that the left arm and hand are capable of. According to the knowledge of today, Rembrandt’s depiction of the arm was surprisingly accurate, though there are some minor mistakes. The surgeons are all looking at a distinct place, although several of them seem to look at the open book on the right. The book is probably De Humani Corporis Fabrica (Fabric of the Human Body) by Andreas Vesalius and contains medical information that supplements what the surgeons hear and see in this anatomy lesson. Have a look at the white starch collars of the surgeons, which have been painted in great detail. It was very difficult to keep these collars this white and to iron them to appear in this perfect form. In this painting, they show the distinctiveness of the surgeons. The man in the center back is holding a piece of paper, which contains the names of the seven spectators present on this painting. Just to the left of the top middle of the painting, you can see the text “Rembrandt f. 1632”. This text means that Rembrandt made this painting in 1632 (“f.” stand for “fecit”, which is Latin for “he made”). Backstory: This painting is part of a series of group portraits for the boardroom of the Amsterdam Guild of Surgeons. On January 31, 1632, Dr. Tulp (38 years old) gave a public anatomy lesson, which was open to surgeons, students, and the general public (who had to pay an entrance fee) and was held in a theater. Such an anatomy lesson was given once a year during the winter to reduce the deterioration of the body and its smell because it was not yet possible to refrigerate the body. By law, they could only use a body of an executed criminal for this event. Surgeons were required to attend this anatomy lesson to increase their understanding of the human body. The 25-year old Rembrandt was also invited to this lesson and was asked to create a group portrait. Note that Rembrandt has given his own interpretation to the anatomy lesson as in a typical anatomy the physician starts by dissecting the chest and the thorax (front of the body) as the organs are the first parts to deteriorate. Nina Siegal wrote a fiction book, called The Anatomy Lesson (Amazon link), based on the story in this painting that is worth reading. Who is Dr. Nicolaes Tulp? Dr. Tulp (1593-1674) was born in Amsterdam and studied medicine in Leiden starting in 1611. He was born as Claes Pieterszoon but changed his name as an adult to Nicolaus Petreius, which was a more credible name for a physician and surgeon. After he established a successful practice in Amsterdam, he changed his name to Nicolaes Tulp (after the beautiful tulips that he saw near his house). He became a surgeon specialized in anatomy, and in 1628 he became the lecturer of Amsterdam Guild of Surgeons, which made him responsible for the yearly public anatomy lesson. He was a very successful surgeon and published a popular book on anatomy. In 1653 he became the mayor of Amsterdam, where he signed the official document with the stamp of a tulip. He was reelected as mayor three times. Who is Aris Kindt? The body of the criminal that is dissected in this painting belongs to the 28-year old Adriaen Adriaenszoon, usually called Aris Kindt (which means Aris the child) and sometimes referred to as Aris ‘t Kint. Earlier that day – some sources mention one hour before – he was publicly hanged and died. Just like Rembrandt, Aris was born in Leiden. He was a thief and had already been caught many times before. Most recently, he was accused of violent robbery; he had mugged a gentleman to steal his cloak. He was convicted to death and was involuntarily paying back his debt to society by serving as the subject for an anatomy lesson. Who is Rembrandt? Rembrandt Harmenszoon van Rijn (1606-1669) is one of the great painters of this world. He was born in Leiden, The Netherlands. In 1631, he relocated to Amsterdam, which was one of the most important cities in the world at that time. Rembrandt was a master of using the contrast between light and dark in his work. He was a very productive artist, and much of his work involved religious scenes, self-portraits, and portraits of others. He has created almost 100 self-portraits in his life. Together with Caravaggio, Rembrandt is by many considered to be the greatest painter of the Baroque period. This painting was one of the first assignments that Rembrandt got when he moved from Leiden to Amsterdam and immediately increased his reputation. Fun fact: This painting became quite popular in the U.S. in the middle of the 20th century as it was featured on the packaging of the Dutch Masters cigar brand. Dutch Masters is one of the most popular cigar brands in the United States. The use of this painting for branding is one of the early examples of how art can successfully be used to build a brand. The managers of Dutch Masters were smart enough to remove the dead body and the forceps from the painting before displaying it on their packaging (the complete painting, however, would not be such a strange choice in today’s tobacco packaging with all the warnings on the packages). Featuring a piece of art from Rembrandt on the packaging gave some sophistication to this relatively inexpensive cigar brand. Nowadays, another picture of Rembrandt, Syndics of the Draper's Guild is featured on the packaging of Dutch Masters cigars.